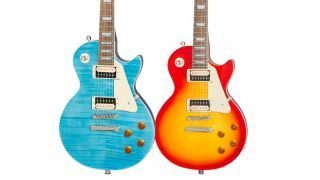 Looking for a top-spec Les Paul for less? We’ve got you covered with this superb deal on an Epiphone Les Paul Traditional Pro-III Plus, which comes fitted with Gibson USA pickups. Guitar Center is selling this spectacular single-cut for just $499, which is $200 off the original asking price of $699. Besides the made-in-USA Gibson ’57 Classic and Super ’57 zebra pickups, this LP boasts a host of tricked-out features, including coil-split, boost and phase on push/pull control pots. As with many Black Friday deals, this offer is only available on specific finishes, in this case Ocean Blue and Heritage Cherry Sunburst. Trans Black and Desert Burst will set you back the regular $699, so be careful which one you click! If your budget doesn’t quite stretch that far, you can also snag the Epiphone Les Paul Traditional Pro-III (sans Gibson pickups) for $299. And if you’re looking for something Slash-ier, the Guns N’ Roses man’s signature Les Paul Standard Plus Top Pro is available for $699.